A pig abandoned or placed in a home without proper screening & contract is at risk for the rest of his life. Many people assume because they found a loving family that is excited to take in their pig that the happiness will last forever. This happy ending does happen, but is rare. Many people have full intention of keeping a pig forever, but for a variety of reasons it does not last. They decide to rehome the pig without an understanding of screening procedures or red flags. This is the beginning of a scary and stressful life for the abandoned pig. He will be passed around several times until he ends up in the wrong hands, or at a shelter where he will most likely face euthanasia. Not all adopted or rehomed pigs will face this life, but without proper placement, most will. This is why reputable rescues and breeders have a take back policy. They will take back ANY pig of theirs at any time for any reason. They will then work to correct any problems the pig is having before finding a new appropriate home. In this way, the breeder or rescue is the tether for that pig. No matter where life takes him, he can always go back to the breeder or rescue. 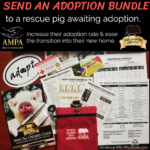 All breeders and rescues registered through AMPA are required to have such a policy, to avoid pigs being abandoned or worse. He may be shuffled from home to home. Confusing him and saddening him. At each turn he will develop more behavioral problems making a good placement nearly impossible. Each home he falls to makes him more and more susceptible to ending up in an unwelcome position. One risk the pig faces is being set loose. People will do this when they don’t want the pig anymore. The pig now faces dangers of starvation, being hit by a car, attacked and killed by dogs or wildlife, or being killed by hunters if they think it is a wild pig. Used for dog fighting rings. While we cannot even imagine this horror, pigs are used in dog fighting rings. There is a survivor of this fate in a Virginia sanctuary with the scars and battle wounds to prove it. Most pigs used in dog fighting rings will not make it out alive. Used for hunting dog training. Hog hunters that use dogs for hunting may use free or cheap pet pigs as bait in order to train their hunting dogs to hunt wild pigs. After much torture, the pig will be killed. Used for hunting practice. As barbaric as it sounds, pet pigs have been used for hunting practice or games. A piglet was rescued in Virginia from a birthday party where she was set free for the children attending to practice with their bows and arrows. Left in a shelter to die. Pigs taken to a shelter rarely make it out alive. If they do, they may face one of these other horrible fates as shelters do not screen homes thoroughly and certainly not for “livestock” animals. Neglect & starvation. One of the most common fates of a pet pig that is given away is a life of suffering, neglect, and starvation. Usually with uneducated owners that do not understand all the wonderful things that make pigs such great pets, and misinterpret their body language and aggression. This leaves the innocent pig living in a home where he is hated or feared, cast off without adequate shelter or companionship. Most intact pigs that wind up in the wrong hands at some point in their life will be used as breeding machines. This is not the comfortable accommodations of an AMPA registered breeder following the associated Code of Ethics (link). These are unethical, uncaring people putting animals through a life of suffering for financial gain. These people do not have a minimum age to breed. They will often breed pigs as young as they will conceive, as merely babies getting pregnant. They do not give the mother’s a break in between litters. In fact they will rip the babies from her nest to sell as bottle babies, putting her back in season quicker and breed her again. They do not care of the health or welfare of these pigs. They will leave them in the mud, rain, storms, they refuse to provide veterinary care or basic housing or nutrition. They sell the piglets to anyone with cash. They find uneducated buyers, lie to them with false promises, putting the pig in jeopardy of being abandoned as it certainly won’t meet the expectations of this family in size or behavior. Butchered for meat. Many abandoned, free, or cheap pet pigs are butchered for meat. They may even be sold on Craigslist to the highest bidder for butcher. A few individuals actually prefer the taste of potbelly pig meat over farm pig meat and will seek out our pets. Some will also butcher the pet pigs for dog food. Protect your pig. If you must rehome, as a reputable breeder or rescue to help you place that pig with the appropriate screening, home check, and contract. Don’t let your beloved pet fall into the wrong hands.